Standardized color names facilitate specification, purchase, and use of colored goods, markers, etc. Companies like Pantone register colors (and names), providing formulas for inks, plastics, toners, and paints to guarantee uniformity and accuracy of color for their clients' products. These color designations are often just numbers and letters; requiring search through process guides to find a particular shade. ICC-Profiles have provision for these spot colors. The combinatorial color dictionaries underlying the Munsell, OSA-UCS, and GIA color scales allow field-workers to encode and communicate color from visual observation. These systems endeavor to partition their color spaces into equally distinguishable regions with a named color at the center of each. A set of color names can be used to restrict selection when a spectrum of colors is not available. 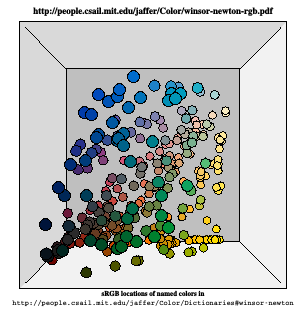 On computers, summoning colors by common names relieves the tedium of adjusting or mousing each color used. Color dictionaries for field work must be small enough to make reasonably quick determinations. A couple hundred names seems to be an upper bound. Larger dictionaries which range into the thousands were created for identifying paints or inks. Common color names (like "blue") are not used alone; but they can be components of names. Such collections of names are meaningless without their charts or samples. These are referred to as idiosyncratic in this article. Color dictionaries should provide a means for specifying colors independent of the gamut limitations of displays and printers, but all the online materials I found in 2001 used RGB coordinates or unconvertable denotations. More problematical is the approach to color assignment taken by most of the authors. One can either try to choose colors matching the color names; or try to find names to describe the colors. Unfortunately, most of the online color dictionaries use the latter approach. Not only are most of the colors they assign located on an RGB grid, they assign common names to the extreme points on the sRGB cube. Most of these extremes lie outside of the print gamut. The limitations of the print gamut result primarily from the physics of reflecting light. Surfaces able to reflect RGB primaries at full brightness when illuminated with full-spectrum white light (D65) require impossibly steep spectral responses. On additive (computer and video) displays these extreme colors look fluorescent or just wrong when used in images, and can be fatiguing to the viewer even when used in non-pictorial visual content. Although not completely free of limitations, pure primary light sources are more practical. Thus when rendering scenes, the color dictionary for glowing objects and lighting can be distinct from the color dictionary for surface colors. The Catalog column in the dictionaries table links to PDFs displaying triangles (or squares), each filled with a color and its name and sRGB or CIE-L*a*b* coordinates below it. In the upper left corner of each catalog page is a legend naming one or two dictionaries and the data format of the catalog. To the left is a portion of the html-4 catalog. As the legend shows, the lower left triangle has a color from the html-4 dictionary with its name and hexadecimal red, green, and blue values below it. 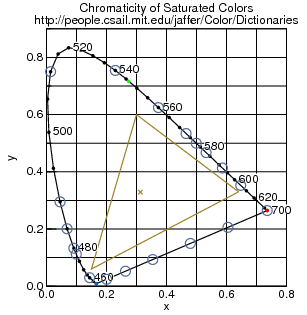 The smaller triangle to the upper right has the color corresponding to the same name from the hollasch dictionary if present (none shown). To the right is a portion of the saturate catalog. The lower left triangle has a color from the html-4 dictionary with its name and decimal lightness (L*), a*, and b* values below it. The smaller triangle to the upper right has the color corresponding to the same name from the x11 dictionary if present. Blue and purple have both saturate and x11 colors, which differ slightly. Because the sRGB coding has limitations, those colors not inside the sRGB gamut (components between 1 and 254) are marked with black diagonal lines. The width of the line varies as the number of sRGB primaries not within bounds. When viewed on an additive display, if a swatch is so marked, you can't be sure that you are seeing the intended color. Colors outside the CIE-L*a*b* gamut (-128 to 127 as coded by ICC-profiles) are marked with horizontal and vertical black lines. In the `saturate' example to the right, bluishpurple, bluishgreen, bluegreen, and purple are so marked. In dictionaries sourced from sRGB values, this will occur only for full white and black. Color Space Dimension Reduction describes the mathematics used to produce these usable color catalogs (unlike the one to right). 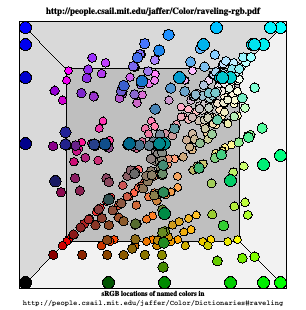 Basically, the colors are ordered by walking a space-filling curve throught the CIE-L*a*b* color space. The colors so ordered are then layed out in a serpentine pattern on each page of the catalog. It starts at the top left, goes down the first (leftmost) column, moves one to the right, goes up the second column, then down the third column etc. Downward oriented columns (1, 3, 5, ...) have the numbers above the color name; upward oriented columns (2, 4, 6, ...) have the name above the numbers. In multi-page catalogs, colors similar to some desired color are usually found in no more than two pages. 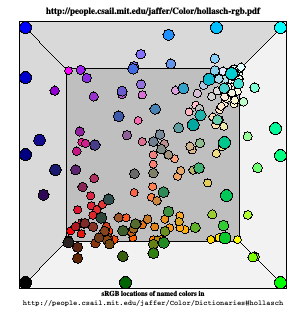 Under the sRGB Space column are PDFs showing the RGB color cube in perspective with a colored ball for each color in the dictionary placed within the cube. A reduced-size image of its cube is also inset in the description of each dictionary. Blue increases going up; green increases going to the right; and red increases from front to back. The neutral axis from black to white runs diagonally from the near lower left corner to the far upper right corner. This view reveals whether colors were chosen from the RGB grid; and also whether the dark colors are underrepresented. 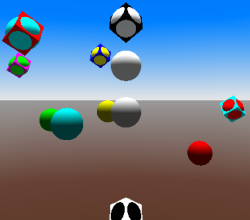 The L*a*b* Space column links to VRML-2.0 (Virtual Reality Modeling Language) files showing a sphere for each color floated in CIE-L*a*b* space. There is a white cube at black and a black cube at white. There is a cyan cube at RGB red; a magenta cube at RGB green; a yellow cube at RGB blue; and vice-versa. If the color-set includes a primary, it will be seen bulging out from the opposite-colored cube, as in the image to left. You will need a VRML plugin to view these files. CIE-L*a*b* space is good for judging a color set's coverage and uniformity. Some screen shots of L*a*b*-space are shown in the Resene and NBS/ISCC sections. 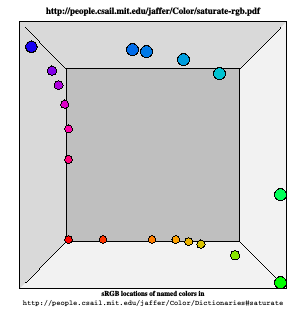 RGB Cubes and L*a*b* Space are for investigating and evaluating color sets; they don't identify individual colors. This saga reads like a comedy of errors. But its legacy looks likely to continue in HTML-5. Once upon a time, someone chose 16 full and half coordinate RGB primaries as the default color-map for early personal computer video cards, perhaps planning to implement full color using a halftone-like method. Instead, these were used as pure colors, often resulting in garish displays. This bad practice was made worse by using common color names to identify them; worse still by putting these in the Windows color-dictionary; and worse still by codifying these common color names (with RGB primaries) in HTML-3.2 and HTML-4.0, two of the most widely used standards in the world. All except silver and gray are out of the sRGB gamut. Red, lime, and blue (and probably others) lie outside of the print gamut. Use of these extreme colors will tend to exacerbate visual differences between displays; also hard copy output will not look like displays. Use of this color dictionary is not recommended. CSS Color Module Level 3 supports both HTML4 color keywords and X11COLORS. Olive, purple, green, and maroon are in both sets; the X11 values have been changed to match the HTML4 values. The list of HTML4 color keywords is: aqua, black, blue, fuchsia, gray, green, lime, maroon, navy, olive, purple, red, silver, teal, white, and yellow. The color names are case-insensitive. Worse than x11, the darkest octant of the RGB cube is nearly empty. Other than the Sinclair Paints colors it inherits from x11, most of the colors are too saturated and too light. The development of HTML has embraced an ignorance of color science. Will the pervasiveness of HTML change our color lexicon? Naming 140 colors, W3schools is merely a subset of css3. The seven color-names dropped (from css3) are the greys (vs gray): slategrey, grey, lightslategrey, darkgrey, darkslategrey, dimgrey. Color chart with meaningful/descriptive color names labels points on a symmetrical RGB grid with combinatorial color names based on 11 of the 16 HTML-4 colors: black, blue, fuchsia, gray, green, lime, olive, purple, red, white, and yellow, but not defining those primary names alone. Aqua, teal, silver, and navy are not used. 234 of the 471 colors are on the sRGB gamut boundary. 27 of these have the adjectives "luminous vivid". Another 27 are "vivid" without "luminous". "Luminous" would be good to apply to all colors out of the reflective gamut, but there are many more than 27 of those. The darkest RGB octant has more colors than x11; the midtones seem a bit sparse. Bang is compared with nbs-iscc in the catalog. Many of the names occurring in both are close in color. Web-searches turn up few original color-name dictionaries. The most replicated one is `/usr/X11R6/lib/X11/rgb.txt' from the X11 window system distribution. Last modified in 1994, does its vintage indicate perfect wisdom of named colors? We start with the early X color dictionaries. `xc/programs/rgb/others/old-rgb.txt' in the X11 source tree is not installed by XFree86. All but 2 of its 72 color names are contained in `rgb.txt', but most of its shades differ. "old-rgb.txt" is the version that was shipped in previous releases; this was originally "tuned" for the Digital VT240 series terminals. `xc/programs/rgb/others/thomas.txt' in the X11 source tree is not installed by XFree86. All of its 71 color names except 'aquamarine' are contained in `old-rgb.txt'. Nearly all its shades differ from both `rgb.txt' and `old-rgb.txt'. It is a huge improvement from `old-rgb.txt'. "thomas.txt" is a version of the older database that was tuned by John Thomas at Tektronix to match a box of Crayola crayons. Using an X-client implementation of the TekColor model, I created the following list of named colors. Appearance on your monitor may vary because of brand, age, and video drive circuitry, but I think you will find it a better match for the average monitor, than the original rgb.txt file from MIT. It is clear from comparing Thomas's sRGB to old-rgb's sRGB that only Thomas looked at the crayons! 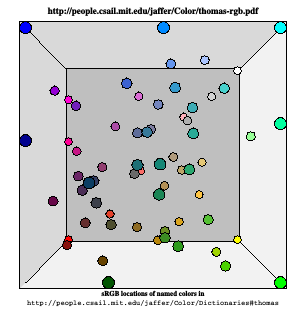 Except for 10 saturated colors, `thomas.txt' is close to realistic for its small set of surface colors. `xc/programs/rgb/others/raveling.txt' in the X11 source tree is not installed by XFree86. It is a near ancestor of `rgb.txt', only 32 of its 447 colors are not contained in `rgb.txt'. A dozen of the remaining shades differ. I find nothing to recommend `raveling.txt' over `rgb.txt'; they both have the problems mentioned in the section about `rgb.txt'. "raveling.txt" has lots of new colors, tuned by Paul Raveling at ISI for the HP monitor. Many colors have been tuned for an HP monitor -- mine, to be exact. Some of the old values were obnoxious enough to bring complaints from users (like "That's Wheat???!!! "); so far early user reports on the new RGB database are favorable. Light and off-white colors, copied from several Sinclair Paints color samples. The intent for adding these is to provide a better choice for light-colored window backgrounds. BTW, I wanted to find ANSI standard colors, but ANSI happily gobbled my $16 without sending the specification I ordered, Then they ignored my followup letter. Nuts to ANSI & "ANSI standards". Special colors such as black, white, and favorite shades of gray. A spectrum of colors, arranged to transition gradually between nearby colors, running from generally blue colors through green and ending with generally red colors. This includes all colors from the old X11R3 database, but they're no longer in (mostly) alphabetic order. The gray scale from the original X11R3 database. One or more Specially named colors. If more than one is present, all are related by lying on a common line running from RGB = (0 0 0) [pure black] to a single point on the surface of the RGB color cube. Four colors at particular points on the same line in RGB space. 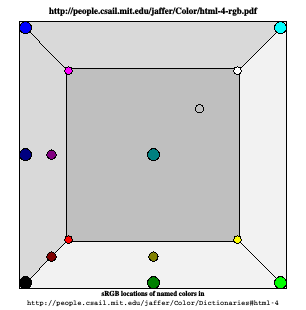 Their names end in "1", "2", "3", and "4", with "color1" being at the surface of the color cube and the others at increasing distances approaching black. Distance of these color points from black is approximately logarithmic. This attempts a rough fit to human perception's sensitivity to intensity. Note that the "original" colors, in this case chocolate and saddle brown, don't always match the scaled points. Does anyone think these changes are a good idea? Crummy idea? Do you have other favorite colors? Can anyone do better at matching some tough colors? Some colors, especially reddish ones, were VERY hard to reproduce, & I'd welcome contributions from other HP users who can get a better match. The clusters were a bad idea. A simple function could have allowed any degree of graying without cluttering up the database. Aside from its numbered grays and greys, `rgb.txt' has 54 duplicates out of 455 colors. The duplications are not entirely consistent: slategray1, ... slategray4 are present; but slategrey1, ... slategrey4 are missing. 202 of its color names are devoted to `gray0' through `gray100' and `grey0' through `grey100'. The intensity values given to each grey<k> is k * 2.55. These grey values are not equally spaced in perceived brightness. And they would only produce equally spaced photometer readings when displayed on a linear RGB monitor. Although the default X color model (RGBi) is linear, a catalog of X11 numbered-greys shows that linear RGB709 biases the perceived `rgb.txt' colors too light. They are more believable when treated as sRGB values. But even then, the bulk of the colors are still too light. When viewed in sRGB space (inset image), the grid nature of `rgb.txt' is evident; as is the relative emptiness of the darkest octant. When viewed in CIELAB space, the `rgb.txt' color set is top heavy, having few dark tones and uneven spacing. In summary, X11's `rgb.txt' is suitable for light sources, but poorly suited for surface colors; and should be interpreted as sRGB in either case. As detailed by Xorg Bugzilla Bug 12293 Cannot install custom rgb.txt file in RHEL 5 , Xorg version 7.1 completely ignores rgb.txt (still present at /usr/share/X11/rgb.txt). rgb.txt is deprecated, sorry. The default upstream is to build without support for it. Your distribution may choose to do otherwise, of course, but that's not for X.org to enforce. There appears to be no way to install a better color dictionary without modifying and rebuilding X11. This device-independent color name database is provided just as an example. to the corresponding color name. So it looks like those advocating for scientific treatment of color by X were defeated in 1992. Even though X11 does not support it, the XCMS color format inspired Color-Scheme's textual representations for colors. XCMS format is used for the non-RGB dictionaries, winsor-newton, fs595c, and saturate discussed below. Although there are many pages offering Netscape color dictionaries, I could not find the definitive site. ns3names.txt is a 127 color subset of X11's `rgb.txt' with different values for `gray' and `green'; and the addition of `lightslate' and `mediumviolet' -- apparently transcription errors of `light slate blue' and `medium violet red'. Steve Hollasch compiled 190 color names into colors.txt. More than 20 of its "whites" match the Sinclair Paints colors in X11. The clump of whites is visible in CIELAB space and sRGB space. The sRGB extremes and a couple of greens will exceed print gamuts; but otherwise a reasonable effort. `colors.txt' looks fine for light sources; and appears better than `rgb.txt' for surface colors. You don't have permission to access /color/ on this server. The 3 dictionary pages are still accessible and linked from 86400 pages (according to Google). `big-txt.html' is an uncredited replica of X11's `rgb.txt' with the addition of `light', `medium', and `pale' -- apparently transcription errors of `light goldenrod', `medium aquamarine', and `pale violet red'. Containing 100 colors, medium-txt.html adds 28 colors to `old-rgb.txt'. Of the shared names, only Orange and OrangeRed differ. Most of the 28 added colors are reasonable, but the bulk of the inherited `old-rgb.txt' colors are not. Containing 47 colors, small-txt.html is a subset of `medium'. Resene Paints Limited, New Zealand's largest privately-owned and operated paint manufacturing company, has generously made their "Resene RGB Values List" available. With over 1300 colours, Resene fills a large volume of the CIELAB space uniformly. 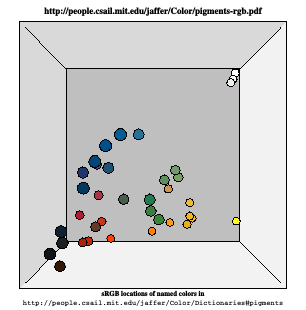 The primaries (red, green, blue, cyan, magenta, yellow, white, black) are absent, as they should be for physically realizable paints. With so many names, most are specific to Resene. But their organization and breadth of coverage will make them less confusing and more useful than the other systems examined here. Resene-rgb.txt is an X11 style color dictionary which Augmenting rgb.txt explains how to install. The "Resene RGB Values List" is an excellent source for surface colors. Despite the problems this metric has, the more distinct colors in its dictionary, the closer will be its answers. The color names in this list were found via Wikipedia, Crayola, and Color-Name Dictionaries like Resene. I removed duplicates and manually edited the list for consistency. Its dictionary contains 1566 colors, most from the 2001 Resene dictionary. Removing duplicates is necessary if the program is to return a single color-name. For use as a dictionary the lack of duplicates means that some names won't be found. The row of colors between saturated green and yellow appears to be original to Mehta. Although the NTC dictionary includes many colors from a pigment-based dictionary (Resene), its assignment of primary colors to RGB extrema inclines against its use for specifying surface colors; smaller pigment-based dictionaries will serve that role better. The only Resene colors to change between 2007 and 2010 were Aluminum, Chamois, and Mahogany. Use Resene-2010. The whitepoint (the reference white) was set too high, causing many colors to have RGB components of 255. [A color with an RGB component of 0 or 255 is indicated in the catalog by a black X.] There are 113 duplications, many in the lightest colors. No paint is completely reflective; so the whitepoint for a paint color should be less than sRGB:255/255/255. The blackpoint (the reference black) was set too low, causing many colors to have RGB components of 0. No paint is completely absorptive; but neither is any video display! So the low blackpoint is a less serious problem. 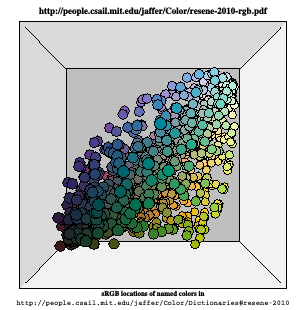 Resene's paint colors are expressed in sRGB coordinates. Some cyan, yellow, and magenta paint colors will be out of the sRGB gamut and not reproduce faithfully from this source. Since 2001, Resene Paints Limited has acquired several other companies and incorporated their colors into its palette, which now numbers over 2400 colors. Examination of download_pencils.xls reveals that both the whitepoint and blackpoint for their RGB values have been moderated. There are still a few R, G, or B values of 255 and 0; but no more than one appears in a particular color. Some singleton 0 and 255 values could arise as the result of trying to assign sRGB values to colors outside of the sRGB gamut. Nearly doubling the size of the "Resene RGB Values List" is not desirable. So I extracted the new RGB values for only the existing list in creating Resene-2010-rgb.txt. Only three colors were lost in the process: "Cedar Wood Finish", "Nutmeg Wood Finish", and "Teak Wood Finish". The number of duplicate colors was reduced from 113 to 36. The Resene-2010 catalog compares this new Resene catalog with the 2001 version. Most noticeable is that many reds and some blues are less saturated. Comparing its RGB-cube with winsor-newton, it looks like this retraction may have been to much. Winsor-newton covers a wider range of mid-tones; and it is actual measurements. Resene-2010-rgb.txt is an X11 style color dictionary which Augmenting rgb.txt explains how to install. The "Resene-2010 RGB Values List" is an excellent source for surface colors. Richard Kirk of FilmLight Ltd has measured paint data for 100 Winsor and Newton water-colour paints in three densities apiece. His data is CIE-L*a*b*, bypassing the gamut limitations of sRGB. None of the colours is out of the CIE-L*a*b* gamut, but 106 colours are out of the sRGB gamut. Winsor and Newton's paint names are mostly idiosyncratic, with some basic colour names. Their current colour chart contains only 96 colours, with many differences from Kirk's list, which was made several years ago. Some of Winsor and Newton's paint names are quite long (eg. Permanent Alizarin Crimson). Given that this list is not tracking Winsor and Newton, I have shortened the names (replacing Cadmium, Chromium, and Manganese with Cd, Cr, and Mn, respectively) and made them more consistent. For each named color, the name with the measurement of the medium density sample has the suffix Medium, the light density has the suffix Light, and the heavy density has the suffix Dark. This makes all the names unique; there are no conflicts with the other dictionaries. Looking at the winsor-newton RGB cube, the darkest octant has a good number of occupants, more than I expected for watercolors. Compared to the nbs-iscc RGB cube, winsor-newton has much better coverage of the mid-tones, nbs-iscc being slightly better at the light and dark extremes. A large cluster of yellows along the bottom right edge of the RGB cube could be due to sRGB gamut limitations; but the cluster also appears in CIE-L*a*b* space. Another possibility is that these yellows differ in transparency; differences which wouldn't be revealed by measurements of individual paint (on paper) samples. If your color application accepts CIE-L*a*b* colors, then winsor-newton-lab.txt is an excellent source for surface colors. https://assist.daps.dla.mil/quicksearch/basic_profile.cfm?ident_number=53815 is a page linking to documents specifying federal standard 595C, "Colors Used in Government Procurement". Although not a general-purpose source, these colors are of use when rendering post-boxes (15050), flags (UN Flag Blue 35250), signs and military clothing and equipment. Although some of the colors have text descriptions, colors are officially identified by unique five-digit numbers. The first digit designates the finish and the second digit a color group. Several colors listed in this standard are the subject of international standardization agreement, MAS Army 440, 7 December 1987, NATO STANAG 2321, Edition 4. Color Cross Reference, Safety, Highway and Camouflage Colors: The following colors meet the special requirements for Safety, Highway and Camouflage colors. FED-STD-595C gives color values for CIE illuminants C, A, F2 (fluorescent), and D65. The charts here use the illuminant C, or D65 if the C entry is blank. fs595c-rgb.txt is an X11 style color dictionary. 41 of the 590 colors are out of the sRGB gamut. The data was originally measured with a spectrophotometer in 1983 and first published in Change Notice 7 for FED-STD-595A in Jan 1984. From all appearances, the data was manually transcribed to a typed list, and it was included numerous transcription errors. The good news is that there's a fairly good data set for 595C that is in the public domain and it is complete. Under contract to GSA, the folks at Hunter Lab measured all of the chips on a lab-grade instrument. You can access this data at: http://www.gsa.gov/portal/getMediaData?mediaId=213223. This document describes the methodology and equipment used to build this data set: http://www.gsa.gov/portal/getMediaData?mediaId=213231. I believe this data is very reliable. fs595c1-rgb.txt is an X11 style color dictionary. 8 of the 650 colors are out of the sRGB gamut. 6 of the colors are labeled fluorescent. Pigments through the Ages is a website exploring the history and use of 40 pigments. On their catalog page, each color is presented by a photograph of a square of the pigment with a white background. Some of the samples are visibly nonuniform. All the pigments, except for the white ones, are fairly dark. I wrote a program which (reading the webpage) finds the name associated with the JPEG and finds the average RGB value of the central 25% of the image, creating the dictionary pigments.txt (and pigments-rgb.txt) from which the other files are derived. Their JPEG images use the RGB colorspace, so the values derived from the images are necessarily limited to the RGB gamut. When painting, one can mix colors. But for computer use, the "pigments" dictionary has an insufficient variety of distinct colors. Deep in Crayola's website is a page presenting the 120 Current Crayola™ Crayon Colors . Each color is presented by a GIF showing a squiggle of the crayon color on a white background (except for the white squiggle on a black background). Crayola gives no technical details of their measurement methodology; but color process control is not their primary focus. 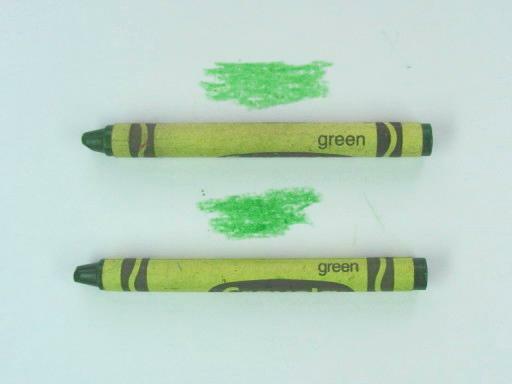 This photo shows the variation between two Crayola green crayons. The squiggles all have the same shape. I wrote a program which scans their webpage to find the names and URLs of the GIFs, read them, extract the color at pixel location [25, 31], and create the dictionaries crayola.txt (and crayola-rgb.txt) from which the other files are derived. Their dictionary is mostly idiosyncratic with some combinatorial names thrown in. Looking at the catalog, it is encouraging that both black and white are not saturated. 23 of the colors are out of the sRGB gamut, mostly in red saturation. Looking at the colors in sRGB-space, there are few colors in the darkest octant. 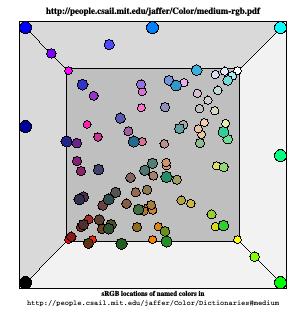 Looking at the colors in CIELAB, the colors are not uniformly distributed, with pronounced clustering. When drawing with crayons, one can mix colors. But for computer use, the Crayola dictionary has an insufficient variety of distinct colors. A compendium of colors and their names from academic, government, textile, dye, paint, horticultural, and manufacturing sources would appear to be the ideal source for surface color names. In The NBS/ISCC Color System, David Mundie has tried to computerize this information. At the core of his system, The 267 Color Centroids lists 267 colors, their Munsell renotations, and hexadecimal sRGB values. 267 colors is more manageable than Resene's 1300. It is enough surface colors for most computer applications. And the centroid names are systematic, allowing users to figure the name of a bluer shade without searching the catalog. Colors `115' and `129' are both named `Vivid Yellowish Green'. `135 Light Yellowish Green 0.7g 7.4 5.2 #007BA7' looks blue. `263 White 2.5pb 9.5 0.2 #FFC9D7' is very pink. Using a program downloaded from http://munsell.com, spot checks of the RGB values versus renotations do not agree with Mundie's data. This may be the fault of the program -- its conversions are not reversible. I was able to locate a library copy of the NBS book. Quantitative measurements are not presented -- all colors are specified using Munsell renotations from Albert Henry Munsell's 1905 publication "A Color Notation" . The fractional renotations in `Cent.html' are not from the book. Each centroid is shown as an outlined area on Munsell hue charts. The color dictionary section does not specify color distinctions finer than the 267. 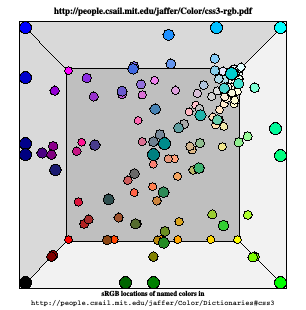 It specifies color ranges with multiple centroid colors, just as Mundie's dictionary pages do. the listing of `Acacia' as 150 is missing. These human sorts of errors indicate that the dictionary was not scanned and read (successfully) by an OCR program. The typography of the dictionary section is sloppy. And use of the letters `l' and `O' in close proximity to numbers would make OCR just about impossible. I checked the first 50 entries in the dictionary and found 3 errors; there are over 5400 color names in total. Correcting all of it is a daunting task, but it has been done (see next entry). The centroids look good in in CIELAB space. Transcription errors from NBS Spec. Publ. 440 have been fixed. The duplicated colors have been separated. The Munsell coordinates have been reconverted using the Munsell conversion program (no longer available) from Gretag-Macbeth. White is now white and the pink bias is eliminated. The NBS/ISCC catalog compares Foster's NBS/ISCC with Mundie's, showing better balance and larger distinctions between centroids. Munsell has changed their standard several times in the last century, so recreating the exact centroids of the 1950s edition of the NBS/ISCC color dictionary would be difficult, if not impossible. 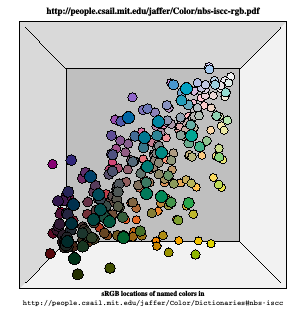 The nbs-iscc RGB-cube shows that the named colors cover less than half of RGB color space. With the RGB primaries being mapped to physically realizable surface colors, this system does not have names for primary illuminants. Adding modifiers such as "luminous" or "bright" would be a way to extend the system to luminance. NBS-ISCC-rgb.txt is an X11 style color dictionary which Augmenting rgb.txt explains how to install. 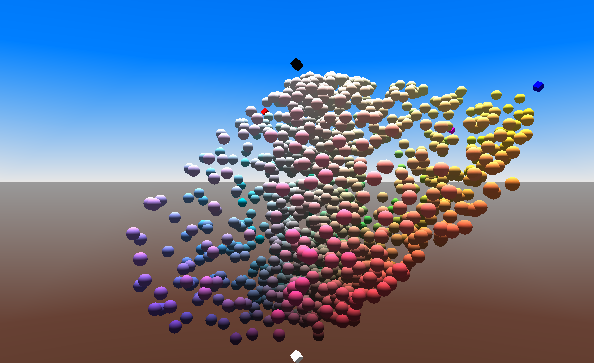 NBS-ISCC Centroids is a good source for surface colors. John Foster has also digitized all 5411 color names in the NBS/ISCC Dictionary of Color Names. This dictionary contains color names used by 32 commercial and government organizations circa 1950. Many names map to more than one color. Some are close in hue; others are not. 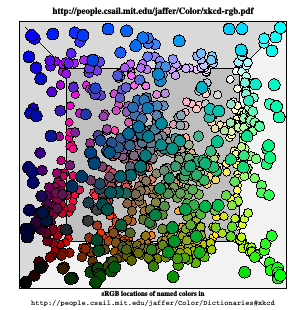 The 5411 color names map to just 267 centroids, but not uniquely. Many names map to each centroid; but one name can also map to many centroids. Capturing only the uncontested color names would reward the obscure ones and avoid the common names we are most interested in. 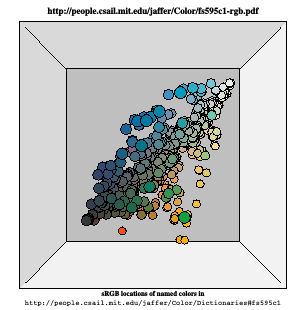 Better would be to discard the outliers and combine the other colors of each cohort. Where a color was midway between adjoining centroids, the average would be closer to the original color than any centroid. 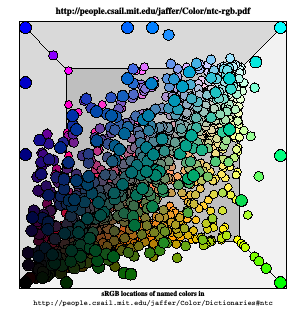 But the state of the art color metrics work only for close colors; partitioning will be an algorithmic challenge. Dictionary of Color, 1st ed. This idiosyncratic dictionary's 3064 names map to 4401 colors, using 223 of the 267 centroids. This idiosyncratic dictionary for interior decorating has 1246 names mapping to 1606 colors, using 206 of the 267 centroids. While using some modifiers, this primarily idiosyncratic dictionary was intended for biology and botany. 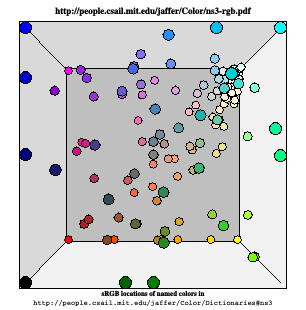 It maps 1096 names to 1602 colors, using 214 of the 267 centroids. While using some modifiers, this primarily idiosyncratic dictionary intended for the "mass market" maps 673 names to 1612 colors, using 233 out of 267 centroids. Although 87% coverage of centroids is good, each name mapping to an average of 2.4 colors reduces its usefulness. The 237 names of this idiosyncratic dictionary map to 267 colors, but only 129 out of 267 possible centroids are called out. This combinatorial dictionary's 88 names map to 350 colors; 263 out of 267 centroids are covered. This combinatorial dictionary seems to be derived from Latin (eg. viridi-caeruleus). Its 128 names map to 789 colors, using 214 of the 267 centroids. But averaging over 6 colors per name means it has little descriptive power. This dictionary is a hybrid of combinatorial and idiosyncratic terms. 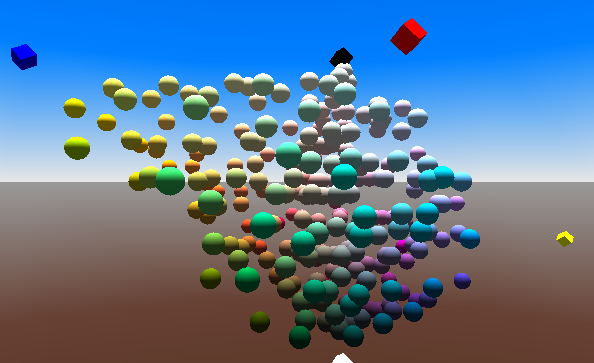 134 names map to 174 colors, using only 73 out of 267 centroids. Most names are of plants or flowers. 199 names map to 261 colors, using only 95 of 267 centroids. This dictionary is a hybrid of combinatorial and idiosyncratic styles. 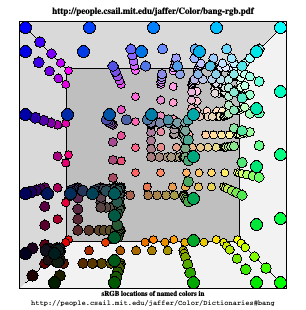 178 names map to 905 colors, using 223 of 267 centroids. Despite covering 84% of the centroids, averaging over 5 colors per name makes this dictionary uselessly unspecific. This combinatorial field-work dictionary's 50 names mape to 176 colors, using 76 of 267 centroids. Again, its focus on soil colors limits its general usefulness. We desire a dictionary that is both specific (mapping each name to fewer than 2 colors, averaged) and covers the NBS/ISCC centroid colors. Only two had enough specificity to be of interest: the rock-color chart (RC),which covered only 1/3 of the centroids; and Colors; (for) Ready-Mixed Paints (F), which covered even less. It appears that the centroids themselves remain the most valuable part of the NBS/ISCC effort. Color bibliographies sometimes refer to A New Color-Naming System for Graphics Languages by T. Berk, L. Brownston, and A. Kaufman, IEEE Computer Graphics and Applications, Vol. 2, No. 3 (May, 1982), pages 37-44. The main problem with this system from a user's point of view is that there is no simple rule to determine which hue terms can be paired, can modify or be modified, and in which order they must appear. In order to use this system, one needs either the list of 267 distinct names, the 31 color name charts, or the set of ISCC-NBS centroid colors. The load on the casual user's memory is too great for this system to be easily used. The syntax of CNS is orthogonal with respect to the three terms of a color specification. All possible combinations are syntactically correct, although some syntactically correct combinations may not be realizable. For example, if a color is very light or very dark, it cannot be fully saturated. Only colors of intermediate lightness can be vivid. The maximum possible saturation of a color decreases as it becomes light or dark. This is the reason for the common description of the color solid as a sphere or double cone, rather than as a cylinder. As the Resene colours in L*a*b* space show, the hull of surface colors is neither spherical nor conical; it is grossly asymmetrical around the color-neutral (vertical) axis. In an application requiring computed color values, the computation can still be carried out in the RGB, HSV, or any other appropriate system, once the initial values have been determined. Assignment of actual colors to the 627 names is apparently left as an exercise for the reader. In 2003, Nathan Moroney presented Unconstrained web-based color naming experiment , at the SPIE/IS&T Electronic Imaging Symposium. It describes a website he created (http://www.hpl.hp.com/personal/Nathan_Moroney/color-name-hpl.html) which invites visitors to submit names for 7 randomly chosen colors. 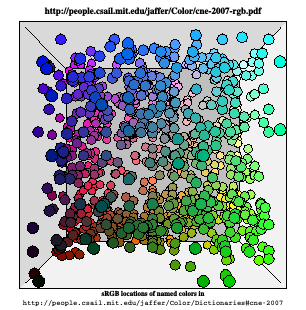 These are collected, vetted, and averaged to create a color dictionary which formerly could be queried at http://h20325.www2.hp.com/blogs/color/archive/2007/10/29/4914.html. 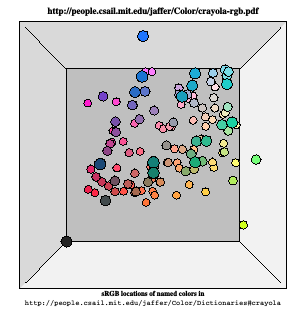 Each query returns a color with its sRGB coordinates, a 3-level indication of how popular the name was, and four nearby named colors as well. By tracing the nearby colors, John Foster collected 871 named colors from the website. Moroney's paper reveals that the randomly chosen colors have coordinates selected from only 6 values which are uniformly spaced from 0 to 255. 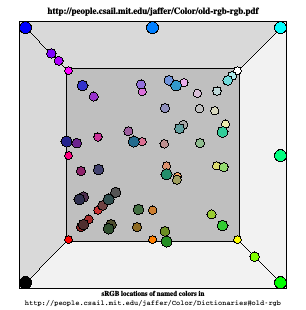 But sRGB is not a perceptually uniform color space! This results in the dark colors being severely underrepresented among the colors presented for naming. 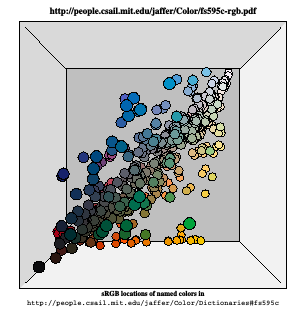 The CNE RGB-cube shows artifacts of the limited dark samples: the darkest octant is relatively sparse; and clumping is visible along the half-intensity axes. Compared with the resene-2010 RGB-cube, the CNE RGB-cube is seen to be distended from around the neutral (black-to-white) axis into saturated primaries which lie outside of the print (and reflective) gamut. The paucity of dark colors also hides some inherent technical issues. Coordinates for dark color names are likely to show more relative variation than the light colors because displays have more variation in contrast ratio, blackpoint, and dark color balance than they do in the highlights. CNE-core-2007.txt is a subset of the CNE dictionary containing only the 212 "widely used", and "less commonly used" colors. Looking at its RGB-cube shows the darkest octant emptiness is worse than for the full CNE, perhaps reflecting that agreement between subjects is harder to obtain for dark colors. set the background color of the page. Moreover, using a black background would harness the human visual system to compensate for some of the differences in blackpoint, improving the agreement of darker colors. All that being said, the Color-Naming-Experiment dictionary is still an improvement over X11. It is good for light sources and mediocre for surface colors. 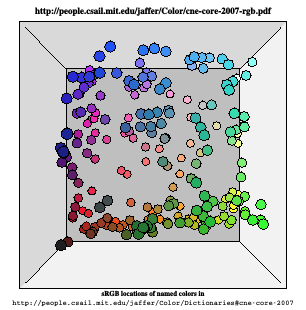 XKCD's 2010 color name survey is similar to the Color Naming Experiment. Rectangles of RGB colors on a white background were presented for the subject to name. The RGB value for a name is based on the location in the RGB color space where there was the highest frequency of responses choosing that name. This was tricky to calculate... In the end, I used the average of a bunch of runs of a stochastic hillclimbing algorithm. For mostly boring notes on my data handling for this list, see the comments at the bottom of the xkcd.com/color/rgb/ page. The algorithm used the hillclimbing setup when there were enough data points available, but for the lowest ones on this list, it used a simple geometric mean of the color values. I've normalized the 'gray' spelling to 'grey' since that was more popular among my users, and when colors varied by punctuation (blue-green vs blue green) I used the most popular version. I left "darkgreen" separate from "dark green", because it wasn't always obvious to me that it was a different color word. With the exception of "green/yellow", the variation between similarly named colors does not seem large enough to justify keeping them separate. Compared with Color Naming Experiment, XKCD has better coverage of the darkest octant. The catalog compares XKCD with CNE. Most of the darker shades common to both dictionaries are darker in XKCD. 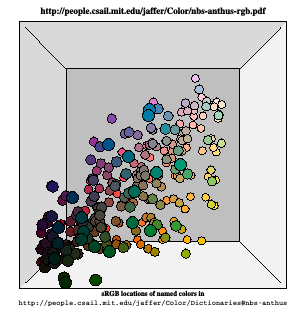 Greens seem to be overrepresented, probably a result of generating samples from a color-space which is perceptually very nonuniform. With its larger set of dark colors, the XKCD Color Name Dictionary surpasses the Color Naming Experiment dictionary (and X11) for surface colors, although a large portion of its colors will not print faithfully. 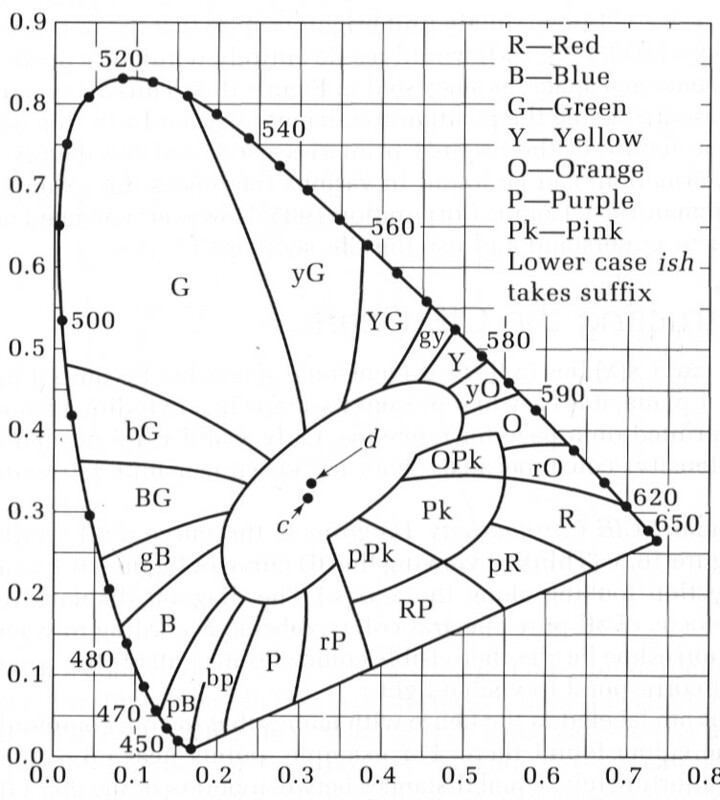 I created the saturate colors from assignments shown on the rim of a chart (below left) showing "Approximate Colors on CIE Chromaticity Diagram" credited to the book Computer Graphics by Francis S. Hill (Macmillan, 1990, pg. 572). Colors from red to green to blue are monochromatic. The colors from blue to purple to red have chromaticities interpolated between 435.8.nm blue and 700.nm red. In the lower right chart, the three CIE-1931 primaries are marked with red, green, and blue dots. Note that the green primary is nearest to the color named yellowish-green, not green. The sRGB gamut and whitepoint are shown by a triangle and x, respectively. Each of the circled color loci is clearly out of the sRGB gamut; and most are out of the CIE-L*a*b* gamut as indicated by the dark box-crosses in the saturate catalog. Although the colors in the PostScript catalog my program generates are specified using CIEXYZ, it is dissapointing that the ps2pdf program in Ghostscript-8.71 degrades those specifications to sRGB in translating PostScript to PDF. Use `saturate' colors for light sources only. The namedColor2Type is a count value and array of structures that provide colour coordinates for 7-bit ASCII colour names. For each named colour, a PCS and optional device representation of the colour are given. 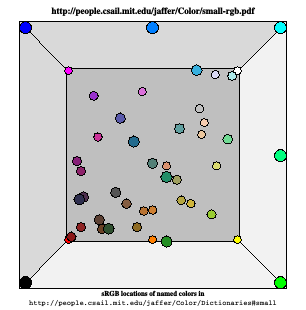 Both representations are 16-bit values and PCS values shall be relative colorimetric. 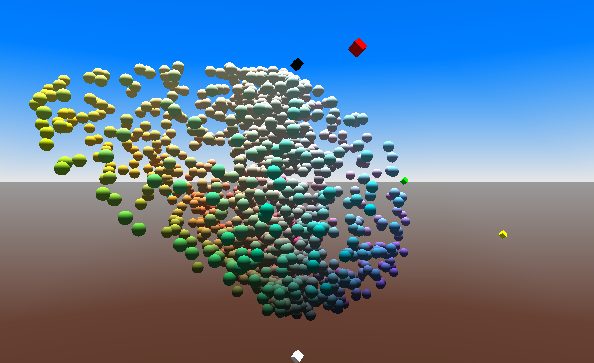 The device representation corresponds to the header's "colour space of data" field. This representation should be consistent with the "number of device components" field in the namedColor2Type. If this field is 0, device coordinates are not provided. The PCS representation corresponds to the header's PCS field. The PCS representation is always provided. Colour names are fixed-length, 32-byte fields including null termination. In order to maintain maximum portability, it is strongly recommended that special characters of the 7-bit ASCII set not be used. This namedColor2Type specification dates back to version 3.2 (1995), perhaps earlier. Only XYZ and L*a*b* colors are supported. Although version 4.2 defines "multiLocalizedUnicodeType", namedColor2Type is restricted to ASCII (and length less than 32.B). The colors in this table are specific to the profiled device. So namedColor2Type appears to be intended for including "spot" colors (such as from Pantone) in a device profile, not for device-independent color dictionaries. Using technical means, the hereditary relations between online color dictionaries have been elucidated. Most online color dictionaries are derived from X11's "rgb.txt" or the Windows VGA Palette without proper attribution and without an explicit license or copyright. Most online color dictionaries suffer from poor technical quality, assign names to RGB colors outside the print gamut and the gamut for reflective surfaces, and severely under-populate the darkest octant of the RGB color cube. are derived from matching or measuring physical samples (except saturate). Augmenting rgb.txt gives instructions for installing Resene-2010 and NBS-ISCC Centroids as X11-style color dictionaries.